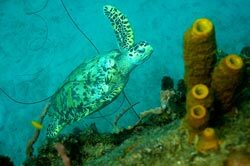 The Hawksbill turtle is listed as vulnerable. It has the classic thick overlapping scales, 'tortoiseshell' carapace wanted for domestic products. It nests on the islands of the northern Great Barrier Reef and Torres Straits and as far south as northern New South Wales. Its flesh is not widely eaten but their shells are the main source of tortoise shell material, used for decorative purposes. They are olive grey in colour with an irregular combination of light and dark streaks, with predominantly black and mottled brown colors spreading to the sides.. They usually the day resting in caves and ledges in and around reefs. Hawksbills mate every second year in secluded lagoons off their nesting beaches in remote islands throughout their range. Size & Weight: Adults are 71 - 89 cm in carapace length. They can weigh between 101 and 46 - 70 kg. 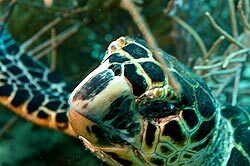 Diet: The hawksbill's narrow head and jaws shaped like a beak allow it to get food from crevices in coral reefs. Sea Sponges are their most important food although they also eat seagrass, sea, anemones, squid,algae, soft corals and shrimp. They even eat also feeds on the dangerous Portuguese Man o' War. Some of the sponges they eat are highly (often lethally) toxic to other animals. 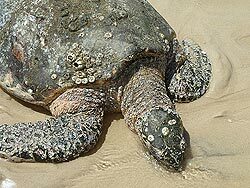 Habitat & Distribution: Typically found around coastal reefs, rocky areas, estuaries and lagoons. Most tropical of all sea turtles. Tropical and subtropical waters of the Atlantic, Pacific and Indian Oceans.